Space shuttle Discovery stands on Launch Pad 39A on the evening of Aug. 25, 2009 after the second launch attempt was called off because of a problem with a fill-and-drain valve. 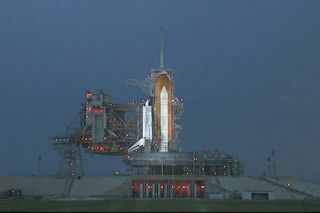 The clockis again ticking down toward launch for NASA?s space shuttle Discovery asmission managers prepare to discuss whether the spacecraft is indeed ready forits planned Friday blast off. NASAresumed the countdown today for Discovery?s planned 12:22 a.m. EDT (0422 GMT) launch Friday morning after testing a suspectvalve that prevented the shuttle from lifting off earlier this week. The valve,which is in the shuttle?s main propulsion system, passed five tests to cycle itopen and closed late Wednesday. Mission managers will meet this afternoon todiscuss those tests and decide whether to press ahead with Discovery?s launchor stand down for lengthy repairs.
? [The valve]didn?t break itself apart. All five times it did exactly as it was expected todo,? NASA spokesperson Allard Beutel told SPACE.com late Wednesday. ?They cantake that to the mission management team Thursday for discussion.? If NASAdecides to forge ahead with Discovery?s Fridaylaunch attempt, engineers would have to begin fueling the shuttle?s 15-storyexternal tank at about 3 p.m. EDT (1900 GMT) today. Mike Moses,head of Discovery?s mission management team, will hold a meeting of shuttlemanagers at 12 p.m. EDT (1600 GMT) to discuss the valve issue and whether it issafe to fly the spacecraft as-is. If mission managers decide to replace thevalve, the repair work could delay Discovery?s flight to October. Discovery?ssix-man,one-woman crew actually has two chances to launch on Friday. In addition tothe morning attempt, another opportunity arises at 11:59 p.m. EDT (0359 Aug. 29GMT). The mission, commanded by veteran spaceflyer Rick Sturckow, is a 13-dayspaceflight to deliver a new crewmember to the International Space Station, aswell as nearly 8 tons of cargo and a treadmill named after televisioncomedian Stephen Colbert. Duringfueling operations Tuesday for a planned early Wednesday launch, the 8-inchvalve - known as a liquid hydrogen fill-and-drain valve - failed to indicate asclosed during a test. Theunexpected glitch forced NASA to call off its second attempt to launchDiscovery toward the International Space Station. Stormy weather earlier onTuesday foiled the shuttle?s first launch try. The drainvalve is part of the plumbing system in Discovery?s aft that allows the 526,000gallons of super-cold liquid hydrogen and liquid oxygen propellant required forlaunch to be pumped into the shuttle?s huge external tank, and then drained outagain if liftoff is delayed. NASA?slaunch rules call for the valve system and its liquid oxygen counterpart towork perfectly in order to attempt a launch. The valves must be closed duringlaunch and are reopened once a shuttle reaches orbit to vent its enginemanifold of any remaining propellant. A positioningsensor may be faulty in Discovery?s hydrogen valve, resulting in the failure toindicate the valve was closed during Tuesday?s prelaunch test, mission managershave said. The tests Wednesday evening were performed at ambient temperature,but the errant position reading came when the valve was immersed insuper-chilled liquid hydrogen propellant. NASA hasuntil Aug. 30 to launch Discovery towardthe space station before standing down due to a schedule conflict withother operations on the Air Force?s Eastern Range, which the space agency usesfor shuttle and rocket launches. If theshuttle doesn?t launch by then, NASA would have to wait until Oct. 17 to tryagain in order to wait out space traffic at the International Space Station. Anunmanned Japanese cargo ship is slated to make its debut flight to the stationin September. A Russian cargo ship is also due to leave the outpost next monthwhile another Russian spacecraft, a crew-carrying Soyuz, will launch Sept. 30carrying a new crew and a Canadian space tourist.